Conditions were tacky and sticky in Garland, Texas, after an overnight storm but a warm and dry morning. The course included new wooded and stair sections, and the popular BMX-style pump track and creek bottom “wall” climb of previous years remained. 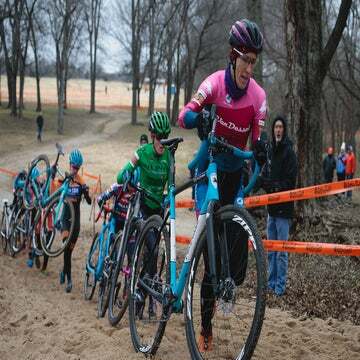 Courtenay McFadden (Pivot Maxxis) attacked on the bell lap of Saturday’s racing to drop Katie Clouse (Alpha Bicycle Co.- Groove Subaru) and power away for victory. A group of three riders went away at the front of the 22-rider field on the first lap, made up of McFadden, Clouse, and Lily Williams (The Pony Shop). The trio marked each other out and a lap later were joined by Raylyn Nuss (Gateway Harley-Davidson Trek). On a fast, windy course, the four raced tactically, none wanting to take the front more than necessary, and the race reached a stalemate. However, with two laps to go, McFadden attacked to drop Nuss and Williams, with Clouse hanging on. On the final lap, McFadden and Clouse had a gap of five seconds on the chasing pair. McFadden attacked again on the new stairs section that climbed back to the top portion of the venue and quickly opened up a gap which she held to the finish, winning in 46:34. Runner-up Clouse crossed the line 14 seconds later. Nuss attacked Williams on the final lap to claim third, 32 seconds behind the winner. 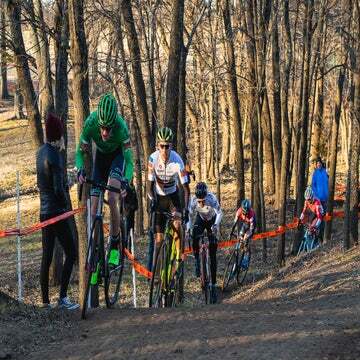 Gage Hecht (Alpha Bicycle Co) used the course’s tricky wooded section to his advantage to drop Andrew Dillman (SDG Factory Team), taking his third Pro CX win of the season. The break went away on the first lap, made up of Hecht, Dillman, Michael van den Ham (Garneau-Easton), and Brannan Fix (Alpha Bicycle co). The wooded section disrupted the front group on the second lap and Van Den Ham went down. He later abandoned the race. Later on, faced with a mechanical, Hecht had to run to the pit to get a new bike while Dillman and Fix stayed together at the front. Hecht had a fast bike change and chased hard, and by lap three was back with the Dillman and Fix at the front of the race. 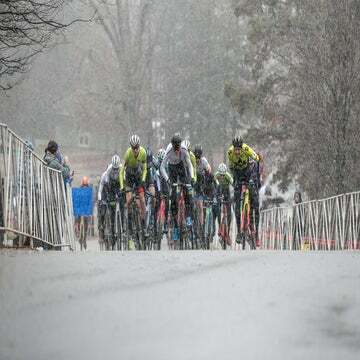 Behind, Cody Kaiser (LangeTwins), Nicolas Gaurin (PACC Racing), and Ben Gomez Villafane (Garneau – Easton) had formed a chase group 10 seconds back. Despite Dillman’s efforts to disrupt any team tactics between Hecht and Fix, the front trio built their lead to 30 seconds, before Fix succumbed to the rapid pace and dropped back. Hecht and Dillman remained together until the critical wooded section on the final lap, where Hecht’s perfect lines allowed him to gap Dillman, and ride on to victory in 55:40. Dillman crossed the line 11 seconds later. Fix came in third, 31 seconds after the winner.